MediumMost of the track is medium walking, but summits are tough, steep and rocky. 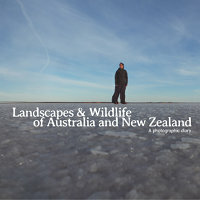 5/5One of the best walks of Tasmania! The Overland Track is one of the best tracks of Australia, but its popularity makes it harder to access now. First you usually have to book months in advance to be able to do it, and second, the hefty price of $200 per person for 6 days makes it a walk accessible only to the wealthiest visitors. But there are other options which will make you enjoy most of the Overland highlights in a shorter time, a bit further away from the masses, and for free. Awesome! This three days loop will let you see the best of the northern part of the track, including the summits of Barn Bluff and Cradle Mountain. Another three to four days loop from Lake St Clair will let you see the best of the southern part as well: Pine Valley, Acropolis and Labyrinth in 3 days. Public transport: TassieLink runs a bus route (once a day) between Strahan and Launceston that stops in Cradle Mountain, with stops in Deloraine and Devonport, six days a week. The bus stops at the visitor centre car park. From there a free shuttle runs every 20 minutes or so from the visitor centre to Dove Lake, stopping at multiple points along the way. If you are in Hobart, there is another bus going to Strahan, but this will require an overnight in Strahan. Another option is to fly or take another bus from Hobart to Launceston. Car: 2 hrs drive from Launceston, 1 hr 20 minutes from Devonport and 4 hrs from Hobart. Park at the visitor centre and take the free shuttle. 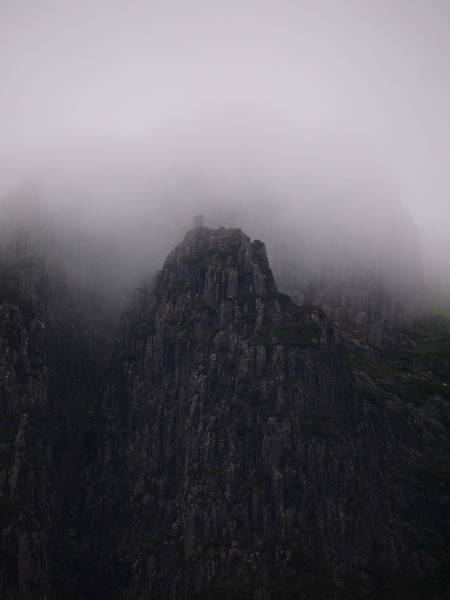 Bicycle: it is quite a climb to Cradle Mountain from anywhere. From Sheffield it is a 1,300 metres climb in 54 km (5 hours), and from Devonport it is a 1,650 metres climb in 80 km (8 hours). From the west coast, if you come from the small town of Tullah there is still 1,200 metres to cycle uphill in 55 km (5-6 hrs). You can cycle all the way up to Dove lake, but you might probably want to leave your bike at the caravan park or one of the other accommodations near the visitor centre and take the shuttle. Note that the shuttle bus is free but you have to go to the visitor centre to get a ticket to be able to board it. Make sure you check the timetable for the last shuttle bus of the third day (usually around 4 pm), or you might face a long three to four hours walk back down to the visitor centre. Scott-Kilvert Memorial Hut is free, but access to the National Park is subject to a pass. Since you will be staying at least 3 days, you can’t only get a 24 hours pass. A eight weeks Holiday pass is $60 for one car (up to 8 passengers), or $30 per person (walkers, cyclists, motorbikes, etc.). Pass can be bought from the Cradle Mountain visitor centre, or most visitor centres in Tasmania, or online on Parks Tasmania website. Scott-Kilvert Memorial Hut is a nice large hut, that accommodates more than 20 people, and there are places to pitch your tent around the hut if you prefer. The hut has a large rainwater tank, tables, and a coal stove, to use only when the temperature is below 5 degrees Celsius, as the coal has to be brought in by helicopter. But it doesn’t have mattresses or cooking facilities, so bring your own stove, mat and sleeping bag. 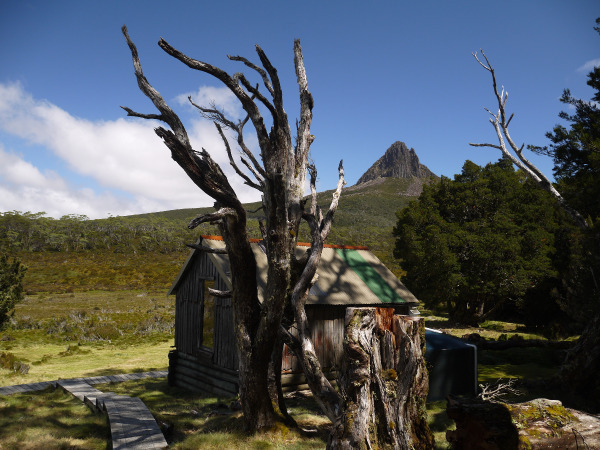 Even if the hut is large, you might want to bring a tent, just in case it is full, as it is also popular with people walking the Overland track, and you might like having the option to camp out if the hut is full of teenagers on an outdoor education camp. Plenty of accommodation options are available around the visitor centre: campsite, lodges, cabins, backpacker, etc. Most of them are really expensive, and the only food supply is the restaurants, cafés, and a limited selection of basic food items at the campground shop. So do your shopping in Sheffield, Queenstown, Devonport or Launceston before coming. Stock up on water at the visitor centre as there is no water at Ronny Creek. Take the shuttle bus to Ronny Creek, the official starting point of the Overland track. Don’t forget to write your name in the log book in case you disappear in the mountains, to help the search and rescue volunteers find you if you are reported missing or overdue. Cross the road and follow the Overland track along a nice boardwalk over boggy plains. After the bridge ignore the Cradle Valley boardwalk on the left and follow the Overland track. Less than 10 minutes later another intersection is reached, ignore the Horse Track on right and continue on the Overland towards Wombat peak. After sidling the peak leave the Overland track and take left to Wombat Pool and then Lake Lilla. If lucky you might spot one or two wombats hiding in the bush around here. After crossing Lilla Creek, you soon reach a junction, take right towards Dove Lake car park. You will soon join the Dove Lake Circuit track and the number of tourists enjoying this short easy day walk. At the car park (with toilets and water) continue on the circuit in a south-east direction, towards Glacier Rock and Hansons Peak. Glacier Rock is a worthwhile short detour to get good views of Dove Lake and Cradle Mountain. After 20-30 minutes you reach the junction with the Lake Rodway track (signed as Hansons Peak), follow this track (to the left), it will climb steadily with some rock scrambling. After a while you reach the intersection with the Twisted Lakes track. You can keep right and stay on the same track to the summit of Hansons Peak: if the weather conditions are fine you will get wonderful views. This track is quite steep with a chain at a point to help you in the steepest part of the track. This might be dangerous in case of very bad weather like snow or high winds. 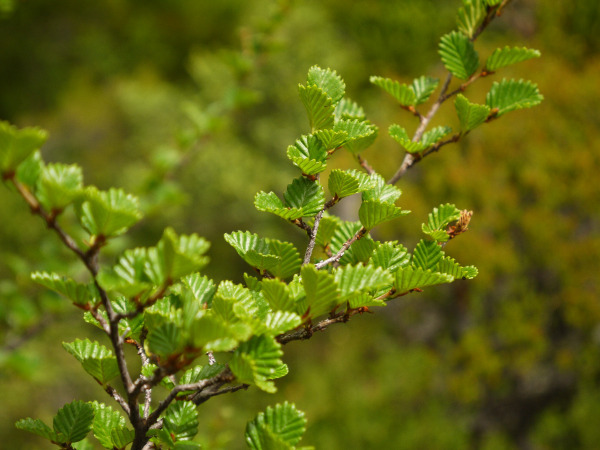 Or you can take left and follow the undulating (and sometimes muddy) Twisted Lakes track, with good views also but to the east, and a good number of deciduous beech trees (also called fagus) and pencil pines. This latter option is about 20 to 30 minutes longer, and usually quiet and away from the masses. Both tracks join back just after Twisted Lakes and it’s not long before you reach yet another junction. To the left is a short track to Rangers Hut, an emergency shelter that can be a good lunch or rest spot in bad weather. But you should continue straight ahead on the Lake Rodway track. The Scott-Kilvert Hut should be signed at this point. It is now about one hour to one hour and a half to reach the hut along a nice track giving wonderful views of the other face of Cradle Mountain. That’s for the days when the summit is not hidden in the clouds. If it is you can still enjoy the many fagus trees and numerous mountain tarns. The hut is not far from the lake, which is a good place to swim in case you feel too hot, as the water is usually quite chilly, to say the least. Leave most of your stuff (sleeping bag, tent, stove...) in the hut for the day, you only need a day pack for today. 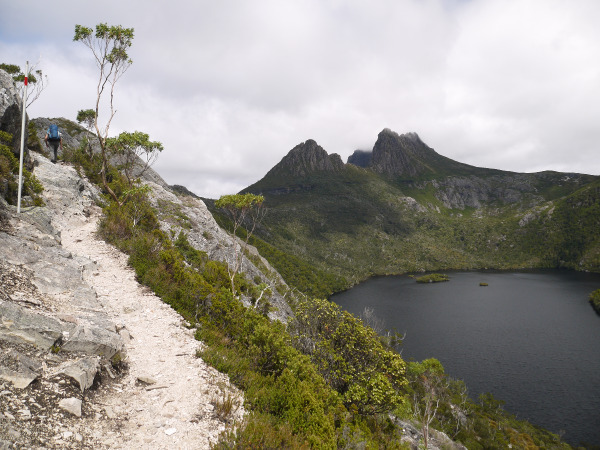 Leave the hut and continue the Lake Rodway track towards the Cradle Cirque and the Overland. The track is climbing, sometimes steeply, sheltered under vegetation, up to the plateau where the force of the wind might surprise you, even on fine days. When the track reaches the plateau ignore any side track and keep to the main track to join the Overland track. At this junction turn left towards Waterfall Valley and Barn Bluff. After 15 minutes of nice walking you get to the junction with the Barn Bluff track. Depending on the weather forecast and look of the sky you might want to summit Barn Bluff first and visit Waterfall Valley later, but I recommend doing the easy trip to Waterfall Valley first and summit Barn Bluff in the afternoon, as the afternoon colors are usually better. If Barn Bluff is lost in the clouds, it might clear up by the time you finish your trip to Waterfall Valley. Waterfall Valley (1-2 hrs): follow the Overland Track down along boardwalks and good views towards Barn Bluff and Mt Ossa to the Waterfall Valley hut, a good lunch spot. The older historic hut is just a bit further. Note that no camping at or around the hut is permitted unless you have an Overland Track pass. Come back the same way. Barn Bluff (2-4 hrs): don’t try the ascent if the wind is very strong, if it’s snowing, icy, or if there is a thunderstorm going on (obviously). Follow the Barn Bluff track, first climbing gently then steeper to the base of the bluff when you will have to start a long rock scramble up, following rock cairns. There are a couple of awkward moves that can be a bit tricky, so be careful. Watch out for the cairns as the way is not always obvious. The views from the top are amazing, but it is usually quite chilly up there because of the wind. Take care when going down. Come back on the same track to the intersection. After completing both trips you have to come back on the Lake Rodway track down to the hut. Be careful on the way down as it might be wet and slippery. Congratulate yourself for summiting the most beautiful mountain of the Overland Track, or think about coming back on a better day if the weather was bad and you couldn’t summit, and enjoy some rest. For the last day there are two options to go from the hut to the start of the Cradle Mountain summit track. The first one is backtracking along Lake Rodway Track towards Hansons Peak to Rangers Hut (day 1) and taking left to follow the undulating and impressive Face Track. This should take less than two hours. 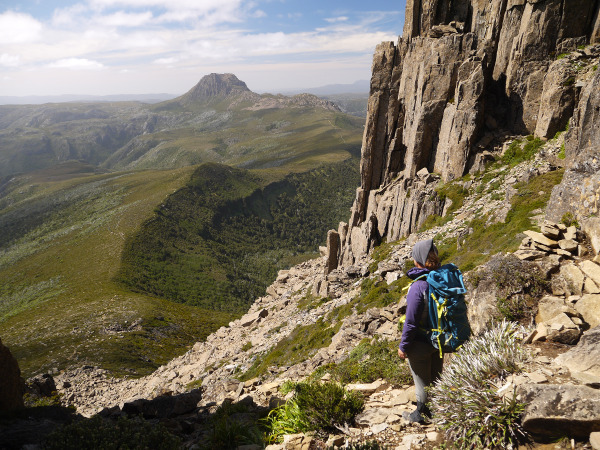 Or as a slightly longer alternative and if you want to do a round-the-mountain trip, you can climb back to the plateau and join the Overland track like on day 2 but instead of taking left to Waterfall Valley, you veer right towards Kitchen Hut. This is about 15 to 30 minutes longer. 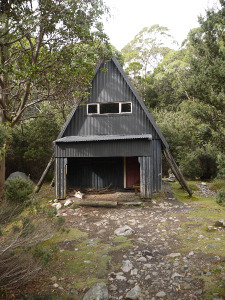 Both tracks join at Kitchen Hut, a small emergency shelter often full of Overland Track hikers stopping here for lunch. Leave your packs at Kitchen Hut and keep only your phone, camera, rain jacket, PLB, some food and other essential items (like your car keys, passport, money, etc.) to summit Cradle Mountain. The summit track is between Face Track and the Overland Track. Forget about the trip if the weather is too bad (heavy rain, ice, snow, lightning, etc.) as the last section of the track has some exposed rock scrambling. The summit track climbs quite steeply in the rocks and require more and more scrambling, until you reach a ridge and cross to the other side of the mountain, where a short section of tricky scrambling is required to get to the summit. Be careful as rocks might be slippery. Come back down the same way to Kitchen Hut and follow the Overland Track to Marions Lookout where good views can be enjoyed on clear days. Go down to Dove Lake following the Marions Lookout Link track, then head left along the Dove Lake Circuit back to the car park where you can catch the shuttle bus back to the visitor centre.